A patient in Scotland who has been tested for Ebola after returning from West Africa, has returned negative results. 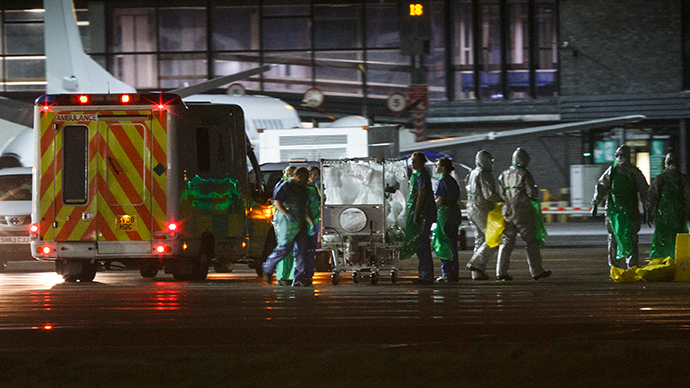 Besides one confirmed case, at least two more patients were being tested for Ebola in Britain. A patient at Aberdeen Royal Infirmary has tested negative for Ebola, Scottish authorities have confirmed. “As a returning health care worker who had recently been in West Africa, they were tested for Ebola as a precaution, although they had not been in contact with anyone who had the disease. A blood sample was taken to the testing facility in Edinburgh and has been confirmed as negative for Ebola,” the statement reads. However, officials said at least two other patients were being tested for Ebola in Britain, according to Reuters. The health service said another case was in Cornwall, England, and details were not available on the second. Earlier on Tuesday a female health worker who was the first person diagnosed with Ebola in Britain was taken from a hospital in Scotland and transferred to London. The woman, identified as Pauline Cafferkey, a 39-year-old nurse with 16 years’ experience, will be treated in a ‘High-level isolation unit’ at the capital's Royal Free Hospital, Britain's designated Ebola treatment center, Reuters cited government officials as saying. "The latest update we have on the condition of the patient is that she is doing as well as can be expected in the circumstances," Sturgeon said. Earlier this year another British aid worker, William Pooley, who was diagnosed with Ebola in Sierra Leone was transported to London, where he was successfully treated. He later agreed to donate blood plasma to try and combat the disease. He subsequently returned to Sierra Leone to continue helping local health workers.